This Hindi remake is fifteen minutes longer than the original Spanish film, yet it doesn’t even have musical numbers. It is structural faithful to its source, but nobody rushes the great Amitabh Bachchan—nobody. 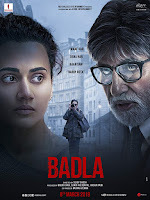 The legendary Bollywood actor plays a legendary jury consultant, who will come out of retirement to crack a particularly sensational case in Sujoy Ghosh’s Badla, the Hindi version of The Invisible Guest, which is now showing in New York. The narrative is basically the same, but many of the genders are flipped in Ghosh’s adaptation. Naina Sethi is the tech entrepreneur who is embroiled in an adultery-murder media feeding frenzy, but she has excellent legal representation. In addition to her high-priced attorney, she will have a session with Badal Gupta, who is considered the best witness prepper ever. Yet, he requires the whole truth to do his job properly—all of it. However, pulling it out of Sethi will be a struggle. Thus, begins a verbal game of cat-and-mouse. Frankly, the circumstantial evidence against Sethi is pretty damning. She woke up in a locked room, next to the murdered body of the lover, Arjun Joseph, who threatened to expose her in a text. Of course, wily old Gupta can tell there is more to the story. He forces Sethi to rewind a few months earlier, when she and Joseph killed a young college student in an auto accident. Instead of doing the right thing, she dumped the body in the swamp, while he was rather awkwardly bluffing his way through an encounter with the victim’s parents. To make matters worse, a blackmailer subsequently lured them to the hotel, where Joseph was murdered and Sethi was knocked unconscious. If you enjoy being played, Badla and The Invisible Guest before it are your kind of films. There are two or three big game-changing twists that are wonderfully over-the-top, totally unlikely, and gleefully entertaining. That is particularly true of Ghosh’s take, which relishes the melodramatic luridness of the scandal and mayhem. Amitabh Bachchan plays Gupta—case closed. Watching him charm, cajole, and interrogate Sethi is more fun than any single film requires. In fact, Ghosh rather sensibly shifts the film’s center of gravity from the flashbacks to the interview sessions, because Bachchan is definitely his ace in the hole. As Sethi, Taapsee Pannu hangs right there in the pocket with Bachchan. In fact, she is wickedly effective at turning each new revelation. Similarly, Tony Luke constantly upends our assumptions as the ill-fated Joseph. Unfortunately, Denzil Smith and his Morgan Freeman-voice are under-utilized as the investigating cop. However, Amrita Singh and Tanveer Ghani provide a moral core to the film as the victim’s parents. Consider yourself warned: Badla will manipulate you and use your assumptions against you, jujitsu-like. It also follows Invisible Guest beat-for-beat, so viewers who have seen the Spanish film will find no surprises here. On the other hand, the tone of Ghosh’s film is not as dark, probably because the ensemble chews the scenery with relish that is utterly infectious. Needless to say, it starts with the great Bachchan. Recommended for fans of Bollywood and twisty thrillers, Badla is now playing in New York, at the AMC Empire.